Similar to Sorting, Filtering will get you the data you need out of a big quantity of data. We will be using the Apple Farm again for our example. Filtering means getting the data you want and display it. And for the data you don't want, you don't display it. in the top 10 values. So we should now change the bottom lines Total and Grand Total. =SUBTOTAL(109,B5:B27) and =SUBTOTAL(109,C5:C27) and =SUBTOTAL(109,D5:D27) for each cell respectively, the total displayed will be the one of the visible cells. The SUBTOTAL function is discussed here. Now let's change this into a table. If you don't remember how to do this, go quickly see the following link. By pressing on the small inverted triangle on the right of the headers, you will see the following menu. 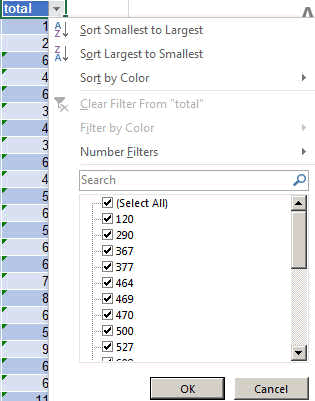 We used this already for the sorting, but now we will use the NUMBER FILTERS. By pressing on them the following menu appears. We will now filter the tree that produced between 400 and 600 apples. This is known to be a healthy tree. You can see the totals are also correct and are the sums of the filtered items only. 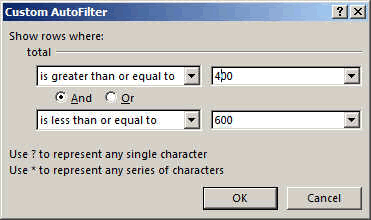 So this is how you filter. 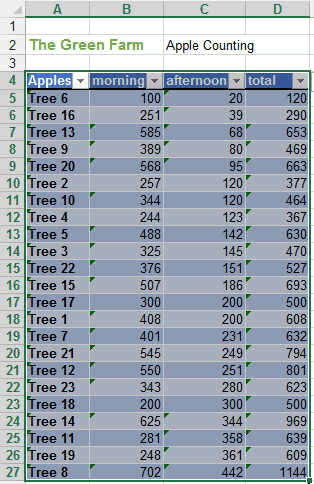 As said before you might want to make more complex filtering, for example trees between 0 and 200 apples as well as trees between 800 and 1500. So this is not possible here except with some complex table manipulation. 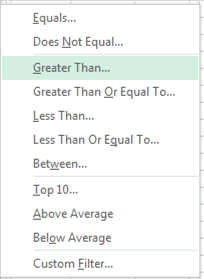 The best is to use conditional formatting. How to filter using very complex formulas? 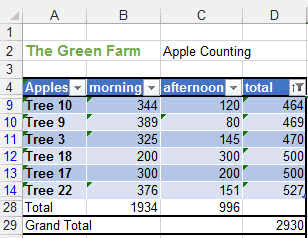 If you need very very very complex and multi parameter filtering, you could use the CONDITIONAL FORMATTING first, which will highlight the data you are interested in (in a few different colors for example), and then, using the filtering, you could just do some color filtering.